For the natural gas pipeline, see Nabucco pipeline. Nabucco (Italian pronunciation: [naˈbukko] ; short for Nabucodonosor [naˌbukoˈdɔːnozor] ~ [naˌbukodonoˈzɔr] ; English: Nebuchadnezzar) is an Italian-language opera in four acts composed in 1841 by Giuseppe Verdi to an Italian libretto by Temistocle Solera. The libretto is based on biblical books of Jeremiah and Daniel and the 1836 play by Auguste Anicet-Bourgeois and Francis Cornu, although Antonio Cortese's ballet adaptation of the play (with its necessary simplifications), given at La Scala in 1836, was a more important source for Solera than the play itself. Under its original name of Nabucodonosor, the opera was first performed at La Scala in Milan on 9 March 1842. It follows the plight of the Jews as they are assaulted, conquered and subsequently exiled from their homeland by the Babylonian King Nabucco (in English, Nebuchadnezzar II). The historical events are used as background for a romantic and political plot. The best-known number from the opera is the "Chorus of the Hebrew Slaves", "Va, pensiero, sull'ali dorate" / "Fly, thought, on golden wings", a chorus which is regularly given an encore in many opera houses when performed today. The Babylonian captivity or Babylonian exile is the period in Jewish history during which a number of people from the ancient Kingdom of Judah were captives in Babylonia. After the Battle of Carchemish in 605 BCE, King Nebuchadnezzar of Babylon besieged Jerusalem, resulting in tribute being paid by King Jehoiakim. Jehoiakim refused to pay tribute in Nebuchadnezzar's fourth year, which led to another siege in Nebuchadnezzar's seventh year, culminating with the death of Jehoiakim and the exile of King Jeconiah, his court and many others; Jeconiah's successor Zedekiah and others were exiled in Nebuchadnezzar's eighteenth year; a later deportation occurred in Nebuchadnezzar's twenty-third year. The dates, numbers of deportations, and numbers of deportees given in the biblical accounts vary. These deportations are dated to 597 BCE for the first, with others dated at 587/586 BCE, and 582/581 BCE respectively. "Va, pensiero", also known as the "Chorus of the Hebrew Slaves", is a chorus from the opera Nabucco (1842) by Giuseppe Verdi. It recollects the period of Babylonian captivity after the loss of the First Temple in Jerusalem in c. 500 BCE. The success of Verdi's first opera, Oberto , resulted in Bartolomeo Merelli, La Scala's impresario, offering Verdi a contract for three more works. After the failure of his second opera Un giorno di regno (completed in 1840 towards the end of a brutal 2-year period during which both of his infant children and then his 26-year-old wife died), Verdi vowed never to compose again. Oberto, Conte di San Bonifacio is an opera in two acts by Giuseppe Verdi to an Italian libretto by Temistocle Solera, based on an existing libretto by Antonio Piazza probably called Rocester. Bartolomeo Merelli was an Italian impresario and librettist, best known as the manager of the La Scala Milan opera house between 1829 and 1850, and for his support for the young Giuseppe Verdi. Julian Medforth Budden was a British opera scholar, radio producer and broadcaster. He is particularly known for his three volumes on the operas of Giuseppe Verdi, a single-volume biography in 1982 and a single-volume work on Giacomo Puccini and his operas in 2002. He is also the author of numerous entries in the Grove Dictionary of Music and Musicians. Michele Lessona was an Italian zoologist. Carl Otto Ehrenfried Nicolai was a German composer, conductor, and one of the founders of the Vienna Philharmonic. Nicolai is best known for his operatic version of Shakespeare's comedy The Merry Wives of Windsor as Die lustigen Weiber von Windsor. In addition to five operas, Nicolai composed lieder, works for orchestra, chorus, ensemble, and solo instruments. Nevertheless, Verdi still refused to compose the music, taking the manuscript back to the impresario the next day. But Merelli would accept no refusal and he immediately stuffed the papers back into Verdi's pocket and "not only threw me out of his office, but slammed the door in my face and locked himself in". 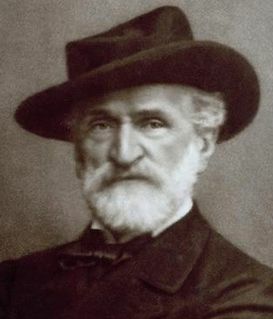 Verdi claims that gradually he worked on the music: "This verse today, tomorrow that, here a note, there a whole phrase, and little by little the opera was written"  so that by the autumn of 1841 it was complete. At the very least, both Verdi's and Lessona's versions end with a complete score. The opening performances, limited to only eight because the season was coming to an end, were "a colossal success." But, when the new season opened on 13 August 1842, about an additional 60 performances had been added by the end of that year. The Israelites pray as the Babylonian army advances on their city ("Gli arredi festivi giù cadano infranti" / "Throw down and destroy all festive decorations"). The High Priest Zaccaria tells the people not to despair but to trust in God ("D'Egitto là su i lidi" / "On the shores of Egypt He saved the life of Moses"). The presence of a hostage, Fenena, younger daughter of Nabucco, King of Babylon, may yet secure peace ("Come notte a sol fulgente" / "Like darkness before the sun"). Zaccaria entrusts Fenena to Ismaele, nephew of the King of Jerusalem and a former envoy to Babylon. Left alone, Fenena and Ismaele recall how they fell in love when Ismaele was held prisoner by the Babylonians, and how Fenena helped him to escape to Israel. Nabucco's supposed elder daughter, Abigaille, enters the temple with Babylonian soldiers in disguise. She, too, loves Ismaele. Discovering the lovers, she threatens Ismaele: if he does not give up Fenena, Abigaille will accuse her of treason. If Ismaele returns Abigaille's love, however, Abigaille will petition Nabucco on the Israelites' behalf. Ismaele tells Abigaille that he cannot love her and she vows revenge. Nabucco enters with his warriors ("Viva Nabucco" / "Long live Nabucco"). Zaccaria defies him, threatening to kill Fenena if Nabucco attacks the temple. Ismaele intervenes to save Fenena, which removes any impediment from Nabucco destroying the temple. He orders this, while Zaccaria and the Israelites curse Ismaele as a traitor. Nabucco has appointed Fenena regent and guardian of the Israelite prisoners, while he continues the battle against the Israelites. Abigaille has discovered a document that proves she is not Nabucco's real daughter, but the daughter of slaves. She reflects bitterly on Nabucco's refusal to allow her to play a role in the war with the Israelites and recalls past happiness ("Anch'io dischiuso un giorno" / "I too once opened my heart to happiness"). The High Priest of Bel informs Abigaille that Fenena has released the Israelite captives. He plans for Abigaille to become ruler of Babylon, and with this intention has spread the rumour that Nabucco has died in battle. Abigaille determines to seize the throne ("Salgo già del trono aurato" / "I already ascend the [bloodstained] seat of the golden throne"). Zaccaria reads over the Tablets of Law ("Vieni, o Levita" / "Come, oh Levite! [Bring me the tables of the law]"), then goes to summon Fenena. A group of Levites accuse Ismaele of treachery. Zaccaria returns with Fenena and his sister Anna. Anna tells the Levites that Fenena has converted to Judaism, and urges them to forgive Ismaele. Abdallo, a soldier, announces the death of Nabucco and warns of the rebellion instigated by Abigaille. Abigaille enters with the High Priest of Bel and demands the crown from Fenena. Unexpectedly, Nabucco himself enters; pushing through the crowd, he seizes the crown and declares himself not only king of the Babylonians but also their god. The high priest Zaccaria curses him and warns of divine vengeance; an incensed Nabucco in turn orders the death of the Israelites. Fenena reveals to him that she has embraced the Jewish religion and will share the Israelites' fate. Nabucco is furious and repeats his conviction that he is now divine ("Non son più re, son dio" / "I am no longer King! I am God!"). There is a crash of thunder and Nabucco promptly loses his senses. The crown falls from his head and is picked up by Abigaille, who pronounces herself ruler of the Babylonians. Abigaille is now Queen of Babylon. The High Priest of Bel presents her with the death warrant for the Israelites, as well as for Fenena. Nabucco, still insane, tries to reclaim the throne without success. Though his consent to the death warrant is no longer necessary, Abigaille tricks him into signing it. When Nabucco learns that he has consigned his (true) daughter to death, he is overcome with grief and anger. He tells Abigaille that he is not in fact her father and searches for the document evidencing her true origins as a slave. Abigaille mocks him, produces the document and tears it up. Realizing his powerlessness, Nabucco pleads for Fenena's life ("Oh di qual onta aggravasi questo mio crin canuto"/"Oh, what shame must my old head suffer"). Abigaille is unmoved and orders Nabucco to leave her. The Israelites long for their homeland ("Va, pensiero, sull'ali dorate"/"Fly, thought, on golden wings"). The high priest Zaccaria once again exhorts them to have faith: God will destroy Babylon. The Israelites are inspired by his words. Nabucco awakens, still confused and raving. He sees Fenena in chains being taken to her death. In despair, he prays to the God of the Hebrews. He asks for forgiveness, and promises to rebuild the temple in Jerusalem and convert to Judaism if his prayers are answered ("Dio di Giuda" / "God of Judah!"). Miraculously, his strength and reason are immediately restored. Abdallo and loyal soldiers enter to release him. Nabucco resolves to rescue Fenena and the Israelites as well as to punish the traitors. Fenena and the Israelite prisoners are led in to be sacrificed ("Va! La palma del martirio"/"Go, win the palm of martyrdom"). Fenena serenely prepares for death. Nabucco rushes in with Abdallo and other soldiers. He declares that he will rebuild the Temple of Jerusalem and worship the God of the Israelites, ordering the destruction of the idol of Bel. At his word, the idol falls to the ground of its own accord and shatters into pieces. Nabucco tells the Israelites that they are now free and all join in praise of Jehovah. Abigaille enters, supported by soldiers. She has poisoned herself. She begs forgiveness of Fenena, prays for God's mercy and dies. Zaccaria proclaims Nabucco the servant of God and king of kings. The historical Nebuchadnezzar II (c. 634–562 BC) took Jerusalem in 597 BC, but the madness plot of the opera differs from both archeological and biblical records of him. In the Book of Daniel, his madness lasts for seven years before his conversion to Judaism. But in the opera it only lasts for the time between the order to kill the Fenena and the Jews, and it being carried out. The biblical story of seven year madness followed by conversion bears more similarity to the Dead Sea Scrolls' story of Nabonidus (556–539 BC), father of Belshazzar in the Cylinders of Nabonidus, than to the historical Nebuchadnezzar. Nabonidus was the last king of Babylon, five kings later than Nebuchadnezzar, and Belshazzar was a temporary regent during Nabonidus' reign. Historical and biblical records agree that the Jews were freed and their temple was rebuilt not by the Babylonians but by Cyrus the Great following his conquest of Babylon in 539 BC. The opera's Nabucco character is thus a composite of historical and biblical Nebuchadnezzar II, Nabonidus and Cyrus. Anachronisms in the opera include the use and tearing of paper documents. In this period such documents would probably have been written on clay tablets in cuneiform. The opera was an instant success, dominating Donizetti's and Giovanni Pacini's operas playing nearby. While the public went mad with enthusiasm, the critics tempered their approval of the opera. However, Nicolai's opinions were in the minority and, today, he has become comparatively obscure. Nabucco secured Verdi's success until his retirement from the theatre, twenty-nine operas (including some revised and updated versions) later. Nabucco is scored for two flutes (one doubling as piccolo), two oboes (one doubling as English horn), two clarinets, two bassoons, four horns, two trumpets, three trombones (two tenor, one bass), one cimbasso, timpani, bass drum, cymbals, side drum, triangle, two harps, strings, and an onstage band. Belshazzar was the eldest son of Nabonidus, the last king of the Neo-Babylonian empire, and regent for his father during the latter's prolonged absence from the city, although he never assumed the titles or ritual functions of kingship. He may have been killed when Babylon fell to the Persians in 539 BCE. Cyrus the Great figures in the Hebrew Bible as the patron and deliverer of the Jews. He is mentioned 23 times by name and alluded to several times more. According to the Bible, Cyrus the Great, king of Persia, was the monarch under whom the Babylonian captivity ended. In the first year of his reign he was prompted by God to decree that the Temple in Jerusalem should be rebuilt and that such Jews as cared to might return to their land for this purpose. Moreover, he showed his interest in the project by sending back with them the sacred vessels which had been taken from the First Temple and a considerable sum of money with which to buy building materials. The existence of the decree has been challenged. Clelia Maria Josepha (Giuseppina) Strepponi was a nineteenth-century Italian operatic soprano of great renown and the second wife of composer Giuseppe Verdi. Nebuchadnezzar III ruled over Babylon. He claimed to be the second son of Nabonidus. Il templario is an Italian-language opera by the German composer Otto Nicolai from a libretto written by Girolamo Maria Marini based on Walter Scott's Ivanhoe. ↑ Budden 1973, p. 112. ↑ Church, Michael (1 April 2013). "Review: Nabucco, Royal Opera House, London". The Independent . Retrieved 1 April 2013. ↑ Melinda Bargreen (2015-08-10). "Seattle Opera's Nabucco: An old story, told in a new way". The Seattle Times . Retrieved 2016-05-08. ↑ Mesa, Franklin (January 2007). Opera: An Encyclopedia of World Premieres and Significant Performances, Singers, Composers, Librettists, Arias and Conductors, 1597-2000. McFarland & Company. p. 184. ISBN 9780786409594. ↑ In non-Italian-language productions, usually shown as priest to Baal. ↑ Parts of this synopsis were first published on Opera japonica (Archived 15 June 2011 at the Wayback Machine ; author: Simon Holledge) and appear here by permission. ↑ Seow, C.L. (2003). Daniel. Westminster John Knox Press. ISBN 9780664256753. ↑ "Prayer of Nabonidus". cojs.org. Center for Online Judaic Studies. Retrieved 10 September 2018. ↑ James Orr (1915). The International Standard Bible Encyclopaedia. Howard-Severance Company. pp. 349–. Retrieved 4 April 2013. ↑ Parker, Roger (1997). Arpa d'or dei fatidici vati: The Verdian Patriotic Chorus in the 1840s. EDT srl. p. 23. ISBN 978-88-85065-15-4. ↑ Matthew Boyden; Nick Kimberley (2002). Joe Staines, ed. The Rough Guide to Opera. Rough Guides. p. 216. ISBN 9781858287492. Parker, Roger (1988), Nabucco, Editor of the Critical Edition, 1988, "The Center For Italian Studies", University of Chicago website. Retrieved 7 April 2013. Wikimedia Commons has media related to Nabucco (opera) .